Where did summer go? | Loch Lomond Livestock Ltd.
Summer has flown by! It’s hard to believe it is already September. June was busy with moving animals to new pastures and getting ready for the haying season. John and Sandra also spent the last 10 days of June and the first week of July in Scotland and stopped briefly at the resort town of Loch Lomond as well as many other interesting places. Brooke started cutting hay and had a couple hundred bales made by the time they got back. The rest of July was spent cutting and baling the rest of the hay, as well as spending a few nights around the campfire at the nearby provincial park. On August long weekend, a reunion for our family was held in our town. Over 100 family members were there, including Lorna, John’s 98-year-old mother and relatives from as far away as Texas and Whitehorse. 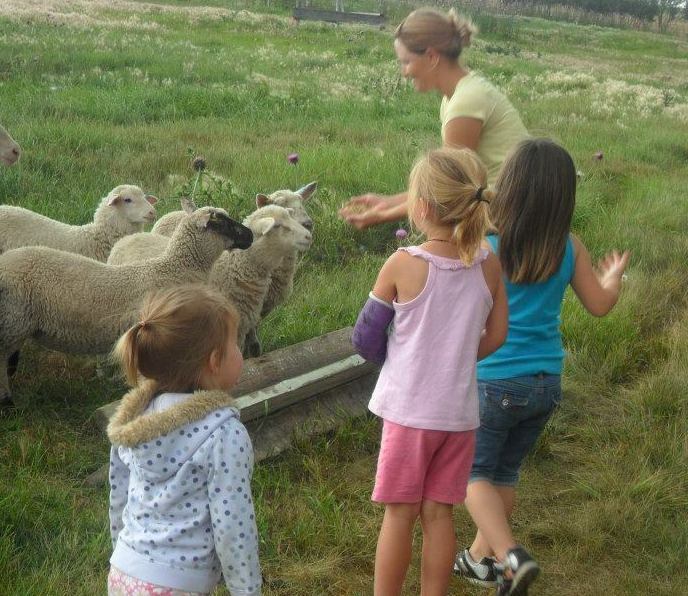 As usual, some of the kids (and adults) wanted to come and have a look at the sheep and the farm. They especially loved Sam (the friendliest guard dog) and the bottlefed lambs. Now we have reached fall and harvest in the area is in full swing. The crops are looking really good and farmers are hoping the warm, dry days continue for a few more weeks!